If there is one category of software that haunts me, it is photo applications. I am no power user … I rarely use my DSLR, have never moved to Aperture or Lightroom, and don’t know my shutter from a hole in the ground. Manual exposure? That’s taking a leak in the back yard, not photography! But what I do want with my photos is one thing: protection. I want the pictures we’ve taken of our kids to be around in 50 years. In other words, longer than me. Over the years, I’ve taken many steps to ensure this is the case. But I never feel confident in my “system” when it comes to photos. Works files? Not at a worry in the world. But our photos are a whole other bag. If you peruse the archives of this site, or have subscribed to the newsletter in the past, you’ll know I was a fan of Picturelife. It did what only Timehop had done: it brought older photos to your attention in a way that no other app has done for us. Well, that and backed up your photos as well. But when that team was bought out, my photos anxiety flared up and I was starting to consider the available options once again. 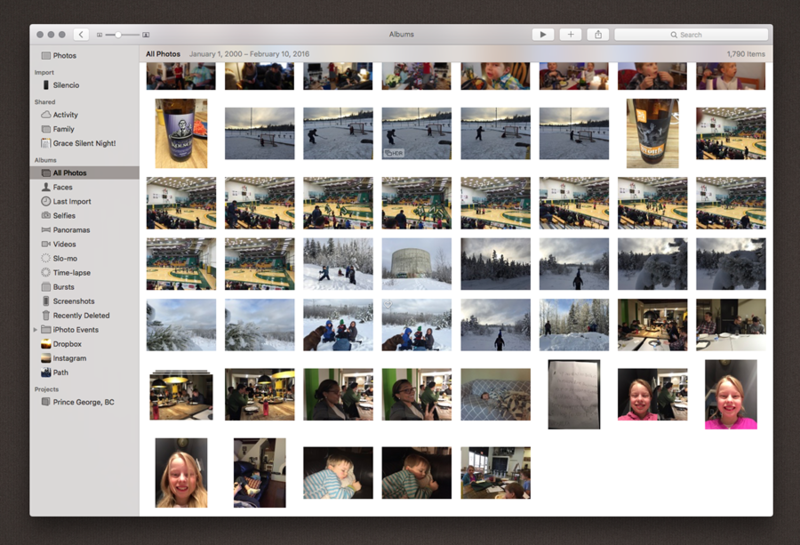 Not long after, the new Photos app from Apple was in beta and available for testing. I thought I’d give it a try as I trust Apple for the most part. In terms of privacy and quality desktop software. But there is some trepidation when it comes to cloud services and syncing of my files. Especially those most precious to me! Not so much. Everything was fine until Christmas. This is when I do my annual task of creating a photo book for the grandparents. Suddenly, the issues with Photos.app started to make themselves known. First, there is the difficulty of using Photos on multiple computers. Our older MBP is used as the family computer, but since it has a smaller SSD drive, our store all the originals on my work computer. Not a big problem, but it means processing photos from the DSLR is a manual process and can only be done on one computer. Nothing too major. Second, there is the issue of storing the Photos library in Dropbox. Do not read me wrong: I don’t think Dropbox is an issue at all. The problem I’ve experienced is that although you tell Photos where the “default system library” is, the app will inexplicably choose another library to receive this designation from time to time. When? I’m not exactly sure as logic does not seem to be a part of the equation. Third, I started creating a photo book and was ready to get this project completed in time to get some family members their Christmas gifts. After having gone though the process of choosing a book title, finding all the desired photos, then arranging them in a mostly chronological order, I discovered that although Photos includes thumbnails in the library on multiple machines, Books require the originals. Which are on the other machine. And that is how I found myself spending an hour one night before Christmas manually exporting/importing photos from one library to another. Finally, once I had all the photos in one library (I think), I was ready to create my photo book. Again. Of course, this process takes time so I started a new Book project on one computer, figuring to finish it on the other. Oh, Photos does not store “Projects” in iCloud, resulting in the project not existing on the second computer. This discovery was followed by one even more fun: Photos does not save Projects when you close it. At least, not every time … mine was gone. Frustration mounting. After completing a Book for the 4th time, I was ready to order. Sadly, Photos had issues with my address not being valid. It was so upset about my postal code that is crashed. Multiple times. Finally, hours later, I used my wife’s contact details successfully. Never mind that the address in both iCloud vCards is exactly the same. The end result? The Books were ordered, arrived ahead of the estimated date, and were enjoyed by the grandparents. And my confidence in Apple, Photos, and iCloud took a serious dent. I believe everything is now in order … but my anxiety about our memories is very much alive and well!